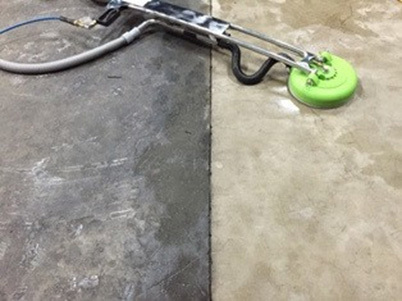 SB 2700 Concrete Cleaner is a highly effective non-acidic cleaner for horizontal concrete and masonry surfaces. SB 2700 can be used to successfully remove light to moderate atmospheric soiling and certain other surface deposits. This product is often used on sidewalks, drive-through areas and parking lots where a non-hazardous labeled cleaning product is an asset. For heavily soiled concrete where conditions permit the use of a stronger product, SB 2790 Con-D-Soil should be considered.